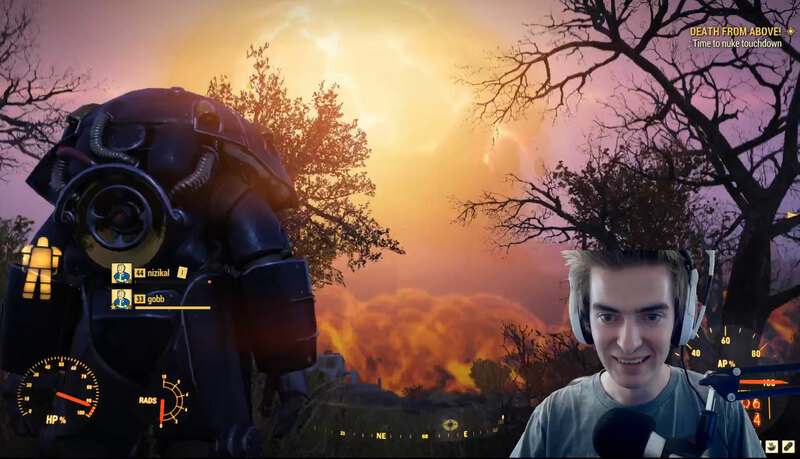 Nuclear weapons are the endgame of Fallout 76, giving players complicated quest goals for acquiring the materials needed, and the launch codes to fire them, but one streamer managed to complete all of that even before the beta ended. This is despite having just over two weeks to do so. Now no one will be nuking anyone else until the game launches on November 14. Fallout 76 is the first full multiplayer Fallout game, operating a bit like GTA Online, or one of those other persistent, limited multiplayer sandboxes. There will only be a handful of players in each world, but for those that are there, nuking one another is a major end game goal. Beta player FrenchTomahawk has become the first person to do that, reaching level 50 as well, thanks to some help from his friends who themselves are very high level, after playing for just a couple of weeks. Here's the moment his nuke landed. Fair warning, there is some excited swearing. The effect of the nuke landing was immediate and devastating, and could prove to be a frustrating, if exciting, element in the game once players have something that they don't want to lose. It is also of concern that they were able to reach this point in the game so quickly, suggesting that Fallout 76 may not have much shelf life among the most dedicated of gamers. How do you guys feel about how Fallout 76 is shaping up? Why is that a mess? Don't fret young one just need to borrow some democrat npc's, and the game will be good again.